We on this adventure was Cassy Brown from Springdale, Mike Cressman from Henderson, Sara Morger from the City of Salt, Kate Duffy from Flagstaff, Ali Miller from Columbus and Tom J from Mt Carmel. Pictures this Rave by Mike Cressman and Sara Morger, and a few from my camera. Cassy leading the pack with a smile, always a smile! The upper Imlay has a bit of brush and is mostly shaded, and with the recent rain was lush and beautiful. 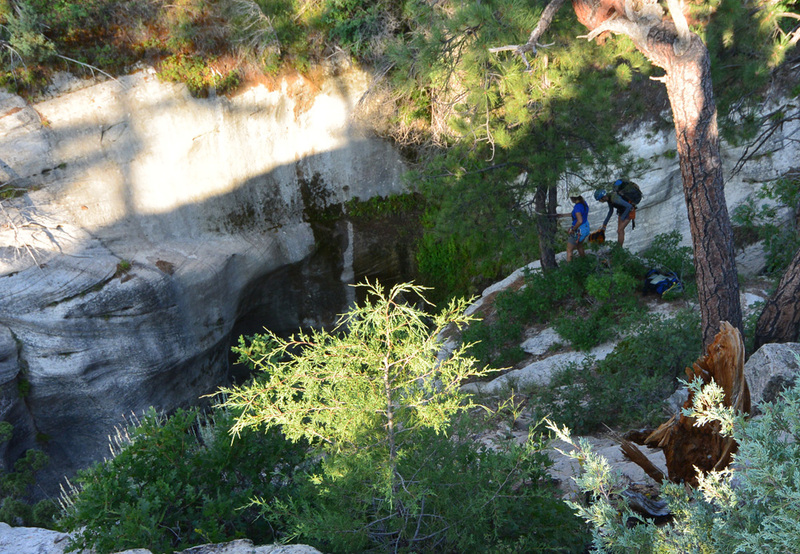 Many short rappels, many swims and deep wades (refreshing), but also slow-going as wading and swimming is slower than plain hiking. The time slipped away as we worked our way downcanyon. What looked like log soup ahead prompted us to finally put on wetsuits… kinda of a false alarm. Eventually we arrived at the Crossroads area and calculated the time – if we wanted to catch the last bus (9:15) we need to hustle. But first, Log Soup! Thankfully, the log soup was short, and dispatched with vigor. Like the upper section, the lower was full full full – fuller than I have ever done it. Seems like the big flood three weeks before had also moved a bunch of logs around (or out), and put a lot of sand in at places. Many changes to the canyon, but full as it was, relatively fast. Certainly there were not problems escaping potholes. We got to the end on schedule, rapped down our rabbits who dashed downstream to make the last bus (2) and then the oops bus (1). Tom, Mike and Cassy walked out a bit slower, Mike complaining every time either of us got close enough to hear… Our rabbits drove back in to pick us up. 5:40 am to 9:30 pm (for me). Fetching the car at Lava… ugh. Then the drive home, interrupted by an hour nap at the North Fork Road for me… a fine day out in the wild with fine friends! !